The Affordable Care Act (ACA) of 2010 introduced a new era in healthcare payment reform. The Centers for Medicare and Medicaid Services (CMS) was tasked to create a number of Alternative Payment Models (APMs) designed to accommodate the multiplicity of healthcare disorders and patient population scenarios, while shifting the environment of health care from fee-for-service (FFS) to value-based care. CMS introduced the Accountable Care Organization (ACO) as an APM designed to encourage voluntary networks of physician groups, specialists, surgeons, pharmacists, care managers, doctors and hospitals to provide cost-effective, quality care- coordination, delivery, and outcomes. In 2012, CMS initiated a multi-level, multi-year strategy to success, using ACOs and the Medicare Shared Savings Program as key components in Medicare delivery system reform and sustainable value-based healthcare. Achieving transformation in the healthcare delivery system takes time, but the transition to provide better care, lower costs, and improved population health is happening. Medicare is the country’s single largest purchaser of care, and the significant driving force behind this change. Though complex and formidable, CMS has taken a systematic yet flexible approach to healthcare reform through the ongoing implementation of Medicare Accountable Care Organizations (ACOs). Medicare ACOs are designed to “provide financial incentives for fee-for-service (FFS) Medicare providers to reduce inefficiencies in care delivery for a population of beneficiaries under their care” (Green vii). As of January 2018, there are 656 Medicare ACOs serving over 10.5 million beneficiaries. Compare these numbers to the original 32 Pioneer ACOs that participated in CMS’s 2012 flagship program, which served approximately 2 million beneficiaries. The Pioneer ACO program was designed as a partnership between CMS and experienced organizations already operating in ACO-like arrangements. It was established to “harness the knowledge and capabilities of healthcare organizations and providers that were experienced in coordinating care for patients across care settings and [who] had some previous exposure to risk-based contracting.” In addition, the Pioneer ACO program “established a laboratory in which ACOs could experiment with and implement strategies to contain cost and improve quality in FFS Medicare” (Green vii). The Pioneer ACO program served as somewhat of a “testing ground” for CMS and for organizations already showing success in ACO-like models. ACOs could take advantage of multiple shared savings and risk options, and CMS could use these ACOs as a resource for learning and implementing forthcoming programs. In 2013, considering feedback and learnings from its Pioneer ACO program, CMS implemented the Medicare Shared Savings Program (MSSP), the cornerstone and largest ACO program to date. Now in its sixth year, and with no set end date, the MSSP has grown from 221 participating ACOs to 561 ACOs in 2018. ACOs are instrumental in the long-term strategy toward value-based care, recognized by the passing of the Medicare Access and CHIP Reauthorization Act of 2015 (MACRA), whose Quality Payment Program (QPP) is dependent upon the success of the MSSP. Like the Pioneer ACO program, the Medicare Shared Savings Program (MSSP) encourages ACOs to assume the financial and medical responsibility of a patient population, while being incentivized with a percentage of achieved savings, when meeting quality and savings performance requirements. Within the Medicare Shared Savings Program, there are four options, or “Tracks,” available with each requiring a three-year commitment and each having different levels of shared risk arrangements and financial rewards. The CMS strategy is for each MSSP ACO to progressively take on more risk as it gains more experience on the road to value-based care. For example, Track 1 is the “on ramp” for ACOs, requiring no financial risk to participate. The financial risks and possible losses are Medicare’s only (“one-sided”), not the ACO’s. The ACO agrees to be held accountable for the quality, cost, and experience of care of an assigned Medicare fee-for-service beneficiary population, but it’s not penalized if it falls short of established benchmarks. If the ACO can make progress toward reducing costs, then it shares in a small percentage of the net savings over that year. Track 1 allows organizations the opportunity to gain population management experience before being required to transition to one of the remaining three tracks, which are “two-sided” risk arrangements. Two-sided agreements mean that ACO’s share in the savings and the losses associated with performance. In Tracks 1+, 2, and 3, ACO’s share different levels of the risk responsibility to receive a greater percentage of financial reward (or penalties) when successful. As Travis Broome notes, “from a CMS perspective, having a few years of one-sided risk provides a necessary ‘safe zone’ needed to encourage participation in alternative payment models, but as ACOs mature, they should be expected to move to two-sided risk or exit the program.” Track 1 is a three-year model with another optional three-year extension before requiring ACOs to shift into one of the three risk-based tracks. Over the six-year history of the MSSP, in addition to the Track 1 “transition path,” CMS has also helped to transition selected physician-based, rural and underserved providers by creating the Advance Payment ACO Model and its successor, the ACO Investment Model. Both were designed to help ACOs transition into the MSSP by offering upfront or monthly payments which could be used to make investments in care coordination infrastructure and redesigned care processes. These investment models are another aspect of the CMS strategy to help make ACOs sustainable during Medicare’s move to a value-based system. In 2016, based on learnings from the Pioneer Model and the Medicare Shared Savings Program (MSSP), CMS continued its ACO strategy toward value-based care by constructing two more ACO models: The Next Generation ACO Model (Next Gen) and the Comprehensive ESRD Care Model (CEC). The Next Generation Model is positioned as the next step after the MSSP, offering financial arrangements similar to the MSSP but with even higher levels of risk and reward. The Next Generation ACO Model also offers more flexibility by including telehealth, 3-day skilled nursing facility, and post-discharge home visit waivers, as well as the option to participate in all-inclusive population-based payments. The Comprehensive ESRD Care Model (CEC) is the first disease-specific ACO model. Considering its learnings from all previous models, CMS initiated this new model specifically to identify, test, and evaluate new ways to improve care for Medicare beneficiaries with End-Stage Renal Disease. Both models are three-year contracts with optional extensions, and both models are scheduled to end in 2020. Medicare ACOs are the key component in the transition to value-based health care, promoting accountability, care coordination, investment in infrastructure, and redesigned care processes for high value, quality, and efficient care delivery. 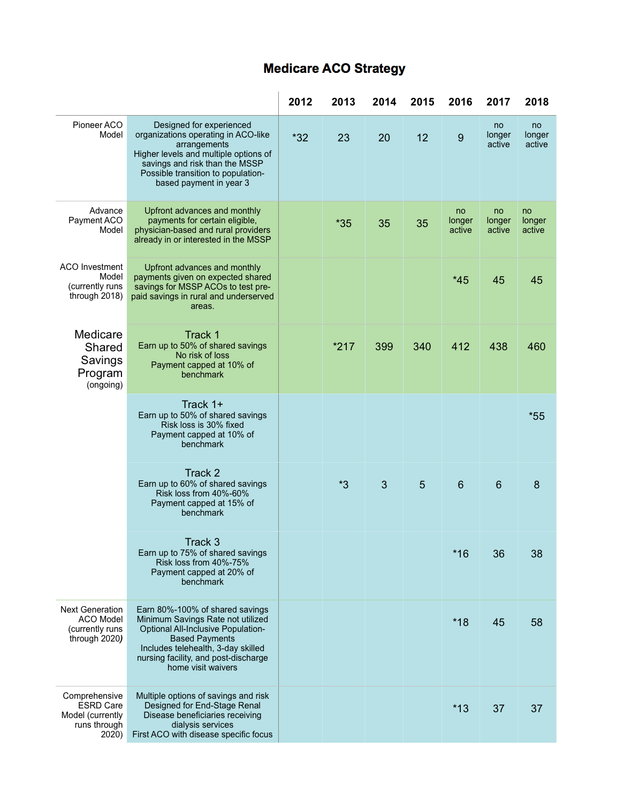 Although the Medicare Shared Savings Program is the impressive cornerstone in the CMS strategy, the complexity involved in healthcare transformation will require ongoing flexibility and adjustments, more innovations in ACO models and programs, and more CMS and ACO partnerships as Medicare moves towards value-based care. Whitman, Elizabeth. “Lured by MACRA bonuses, more Medicare ACOs venture into risk.” Modern Healthcare. March 4, 2017.